Are you a summer tomato canner? I’m sad to say I didn’t grow up with that tradition, but I do love tomatoes, especially summer ones, so I understand wanting to make the most of the season. Last summer I even bought up 15 pounds of tomatoes from my farmer’s market and set out to make Kenji’s summer tomato sauce. It was a lengthy and involved process, but the end result was delicious. My only qualm with the whole deal was having to spend so much time inside my hot kitchen with my oven on, reducing tomato juice to paste, and my stove on, reducing tomato pulp to sauce. It was a really good learning experience, and the end product was truly tasty, but I feel like big batches of summer tomato sauce are just logically made for the slow cooker. 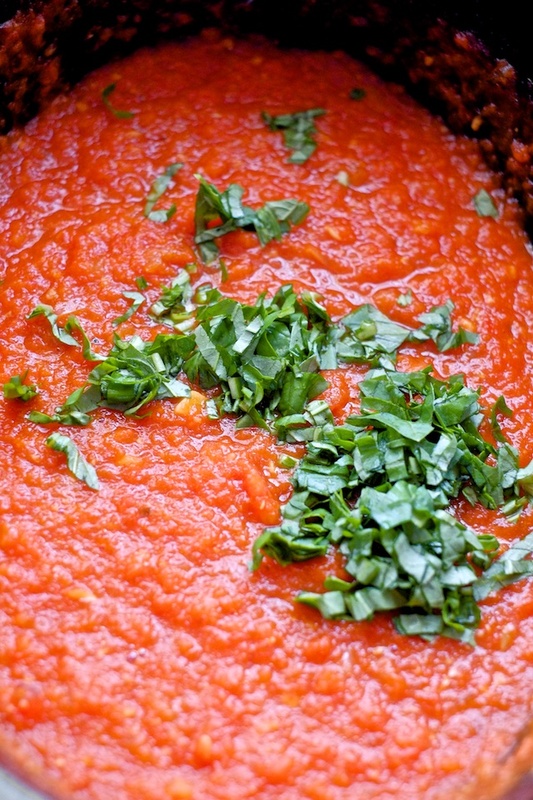 So I threw together a recipe for tomato sauce using fresh tomatoes and a slow cooker. 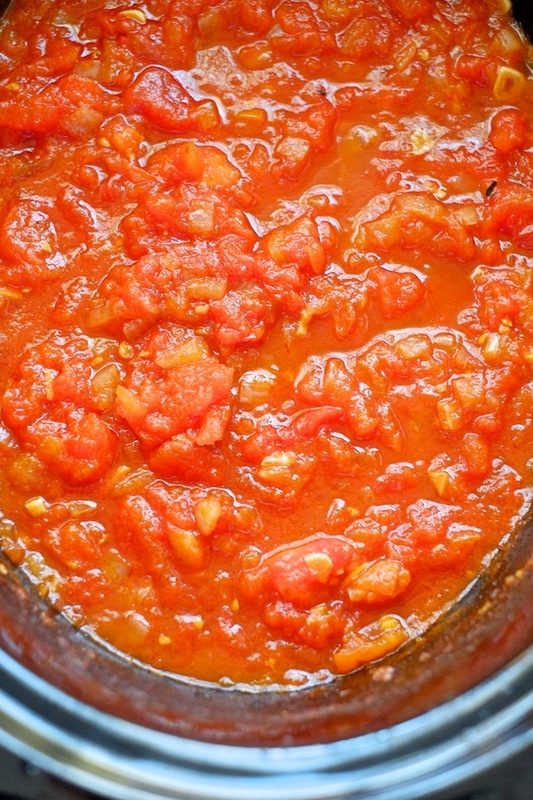 I think it’s pretty bomb, but I’m neither Italian nor a seasoned summer tomato putter-upper, so if you have a tomato sauce recipe you like better, try it in the slow cooker and tell me what happens. 1. Set your slow cooker to high and pour in your olive oil with the diced onion and sliced garlic. Let the onion and garlic cook while you prep your tomatoes. 2. If you have a food mill you can simply cut your tomatoes into chunks and run them through the food mill until the skins and seeds are separated from the tomato pulp and juice. If you don’t have a food mill, you’ll want to blanch your tomatoes after cutting slits in the skins, peel them, seed them, and strain the seeds from their flavorful juice. It’s a bit of a process, but if you have made tomato sauce in the summer before, you get it. What you want is as much of the tomato pulp and juice as possible without the gross seeds or skins. This is a great tomato peeling and seeding tutorial, my only beef with it is that they don’t strain the juice from the tomato seeds and put it back with the tomato pulp because it adds a lot of freshness and flavor to the sauce. So you should do it. 3. When you are finished with the tomatoes, turn your slow cooker to low and add the tomatoes, a healthy pinch of salt, tomato paste, and wine (if using) to the cooker. 4. Cook on low 4-6 hours with the lid cracked to allow steam to escape, or until you reach the consistency and flavor you want. Longer cook times result in a sweeter, more concentrated sauce while shorter cook times preserve a bit more of that ripe tomato freshness. Taste, add salt as necessary and give it a few more hours if you want more sweetness (you can also add a pinch of sugar for extra sweetness if you like). 5. If you didn’t use a food mill to prep your tomatoes, decide if you want to leave your sauce chunky (like the second picture) or if you want to blend it (I sort of half-blended mine for the finished version). Immersion blenders are perfect for this. Finish the sauce with the fresh basil. 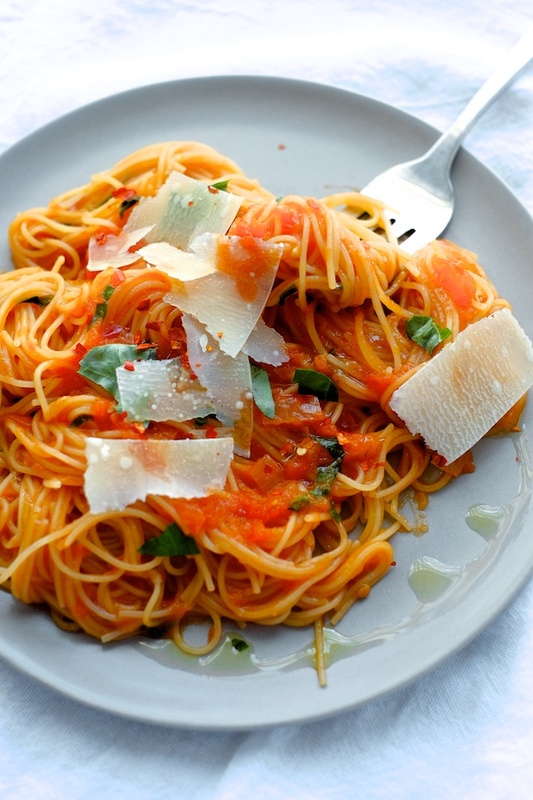 Serve with your favorite pasta, crushed red pepper flakes, and parmesan or pecorino.